Focusrite expand the Saffire range with their new Virtual Reference Monitoring technology. The original Focusrite Saffire Pro 24 Firewire interface was reviewed by our own Matt Houghton in the August issue of SOS, with its more expensive siblings reviewed in the January (Saffire Pro 40) and May (Liquid Saffire 56) editions. Much of the underlying hardware and control software is common across the range, with the same preamp circuitry and similar routing and mixing functions — in fact, the only physical difference between the Pro 24 and the Pro 24 DSP is the addition of a second headphone output (with its own volume control). Rather than cover that ground again, let's move right on to the new facilities. The new DSP functionality serves two separate roles, the first being 'latency free' dynamics and EQ processing on the two primary inputs (and applicable to the record or monitor signals, or both), and 'comfort' reverberation that can be added to the input monitoring while tracking. 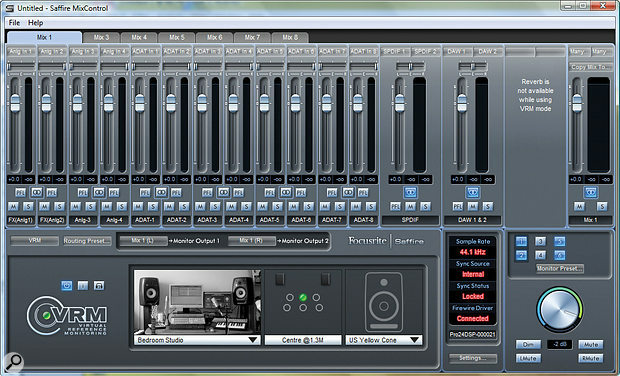 The second role is Focusrite's new Virtual Reference Monitoring (VRM) system, which claims to help make headphone listening a more natural and familiar experience when mixing — although this processing is only available on the first headphone output, I'm afraid (although it's also on line out 3‑4, which shares the same software mixer). The DSP signal processing is only applied to the first two input channels, but includes a well‑specified compressor that is apparently modelled on Focusrite's hardware optical compressor technology. All the usual controls are provided for Bypass, Threshold, Ratio, Attack, Release and Gain Make‑up, and it comes complete with a gain-reduction meter. There is also a four‑band parametric equaliser with nicely overlapping bands and the ability to switch the top and bottom bands between shelf and filter modes. The monitoring and recording paths for the first two input channels can be configured independently to record the clean input signals or the DSP‑processed versions as required, although it's not an entirely intuitive procedure and requires the use of the internal loop‑back facility if you want to record without DSP effects. I had to read the (very good) manual to figure this bit out! The onboard reverb processor can accept a contribution from any of the input channels, and each of the eight independent mixes from the software application can include the reverb output through a dedicated stereo return fader. Although the reverb processor is pretty basic, it is very usable, thanks in part to the use of just three controls: Size (adjusts both pre‑delay and decay time), Pre‑filter (applies high‑ or low‑pass filtering to the reflected sound) and Air (adjusts the effective HF damping). As a result, dialling up something usable is very quick and easy and the sound quality is more than adequate for a comfort reverb. The problems of trying to mix while monitoring over headphones will be familiar to most readers. The flat stereo image running on a line straight through the middle of the head doesn't help, and judging critical EQ, reverb and balance issues is just very difficult. While it is a skill that can be mastered, most will agree that mixing on real speakers is considerably easier! Sadly, though, we don't all have access to monitoring environments with high‑end monitors or excellent acoustics, and often headphones are a necessity when mixing at home late at night, to avoid disturbing neighbours. The VRM system has simple controls for selecting room, listening position and speaker type. The idea of 'virtual monitoring' isn't new, of course, and there have been several convolution or modelling‑based binaural headphone systems that aim to bring the natural acoustics of a real monitoring environment into the realm of headphones. Focusrite have gone slightly overboard with their modelling‑based VRM system — probably just because they could — to offer a mind‑boggling 100 different monitoring 'scenarios' comprising different monitors, rooms and listening positions. Personally, I'd have been happy with just one or two really good room and speaker combinations... but that's not really what's on offer here. Instead the Pro 24 DSP user has the option of three different virtual environments (professional studio, living room and bedroom studio), with 16 different nearfield speaker models, each in a handful of different positions relative to the listener (including side‑offset positions, rather bizarrely). Different sub-sets of speakers are available to each room, but the list includes models based on typical current project studio monitors from the likes of Adam, Genelec, Quested and KRK, plus the Yamaha and Auratone sealed‑box classics, and a few oddities like a Creative computer desktop system and a Phocus (who?) flat screen TV, as well as B&W and KEF hi‑fi models. All good stuff, naturally... but I can't help feeling a little disappointed here. These are all competent speakers but hardly high‑end studio fodder. There was surely an opportunity here to use this technology to convey the user to the very best professional listening environments on the planet, and to audition audio over the very best high‑end monitors, but instead they can choose to leave their modest bedroom studio to sit in a virtual bedroom studio and listen to virtual project studio speakers of the kind they probably have on the shelf in front of them anyway! Where are the Olympic Studio, Ocean Way or Abbey Road Studio 1 environments? Where are the big ATC, K+H or PMC monitoring systems? Nothing in this list of options has a bass driver larger than eight inches, and none are more than two‑way configurations either. If the aim was to retain familiarity with typical project studio systems, then fair enough — it has achieved that very well — but I can't help thinking a wonderful opportunity has been missed here. Having said all that, I'm told that this first VRM system is being introduced as a 'proof of concept' and that, as an entry‑level device, the boffins at Focusrite felt that this initial set of virtual monitors was appropriate to the target market. Apparently there are plans afoot to analyse more sophisticated monitoring systems for use within more up‑market VRM‑equipped products in the future. I've heard several similar modelled speaker/room systems before, and I have to say that the Focusrite VRM system is certainly better than most, but perhaps not quite as breathtakingly realistic as some. Switching between rooms and speakers produces a reasonable impression of the expected characteristics, and by shutting my eyes I could force myself to believe I was in a different environment to the one I was actually in (my office, in fact). These aren't intended to be absolutely faithful recreations of physical room/speaker combinations, but the general trends and impressions are pretty convincing and broadly useful. Most importantly, the soundstage does 'appear' to be in front of the listener rather than through the middle of the head, and that alone is a very significant advantage when it comes to mixing. In fact, after a little familiarisation, I found mixing while using the VRM system much easier than mixing on a raw stereo headphone feed and although I'd rather use decent monitors in a decent room, this is a very good and practical alternative — and far more so than the more simplistic HRTF (Head-Related Transfer Function) based headphone processors found on some monitoring controllers and headphone amps. The Pro 24 DSP builds on the capabilities of the previous model with some very useful additional facilities. The ease of controlling the source dynamics and adding 'comfort reverb' for local monitoring makes vocal recording a far simpler process than it might otherwise be, and the new VRM technology is not only likely to be very useful and attractive for anyone forced to mix on headphones, but also shows great promise for future products. Another new addition to the Saffire fleet is the Saffire 6 USB, which costs £160.99$199.99. As the name implies, this is a USB‑based audio interface, rather than a Firewire design, and its two‑in, four‑out I/O configuration makes it the most affordable of the Saffire range. It features a pair of mic/line inputs on the front panel (with combi‑XLR connections and independent channel switching for a DI mode), while the rear panel boasts two balanced +4dBu outputs and four unbalanced ‑10dBV outputs (the first two being duplicates of the balanced output channels). It also features MIDI input and output connectors, and comes with Ableton Live Lite 7, Novation's Bass Station synthesizer, over a gigabyte of samples, and the Focusrite FX Suite (AU/VST plug‑ins), which includes a compressor, gate, reverb and EQ. Useful signal processing on primary inputs. Simple but effective 'Comfort Reverb' option on monitoring. Loopback channels are a very useful facility. Recording with and without DSP processing not entirely intuitive. VRM system currently lacks high‑end monitoring system options. An enhanced version of the original Saffire Pro 24, with an extra physical headphone output and internal DSP facility. Virtual Reference Monitoring aims to create the impression of real loudspeakers in a real room when listening on headphones, thereby making headphone mixing an easier and more natural experience.